Cassia bicapsularis or Senna bicapsularis is known by many other common names including Cassia, Golden Showers, Butterfly Bush, Winter Cassia and Christmas Senna. Cassia, a native of Brazil and other tropical regions, is a medium sized fast growing evergreen flowering shrub and a member of the Royal Poinciana family. It is easily trained and pruned to tree form and can attain a height of 12 feet or more. Cassia is widely grown and well adapted to hardiness zones 9 to 11. It is also a good choice for container growing if properly pruned. Foliage is dark green and the leaves consist of three to five pairs of leaflets. Although evergreen, foliage may yellow and drop if temperatures during the colder months fall to the thirties or below. If a hard frost is encountered, cut the entire plant down to ground level and throw a shovel full of soil over the stump. New growth will emerge when the weather warms up in spring. Beginning in late fall, Cassia puts out a stunning display of spectacular deep golden yellow bloom clusters which will last and continue through December if there is no damaging frost. Flowers are very attractive to butterflies and bees. Unfortunately, yellow sulphur caterpillars also love the emerging buds, flowers and leaves and if left to themselves, can defoliate an entire plant in a short time. If your're not squeamish, they can be picked off by hand before they do much damage. Other than that, insect pests or diseases are rarely seen on healthy plants. 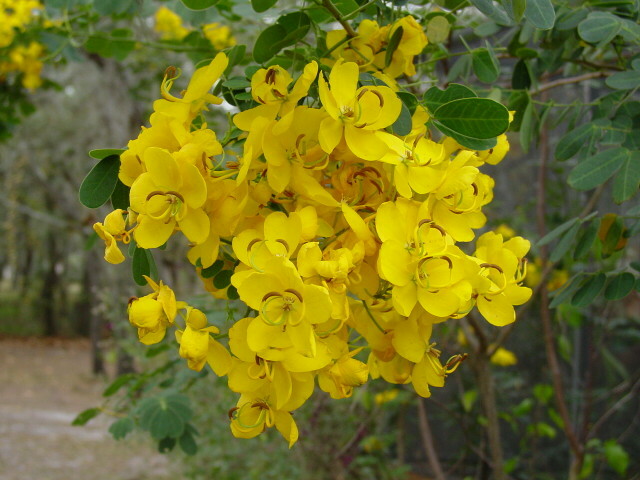 Cassia grows and flowers best in full to partial sun, but will tolerate part shade. It is not fuzzy as to soil condition, but as any other plant, will respond well to a little care such as regular watering and an occasional dose of fertilizer. Late spring and early summer is the time to pinch back growing tips which will encourage branching and increase flower production. After flowering, the plant produces brown cylindrical seed pods 5 to 12 inches long. Seed will grow very easily if first scalded with boiling water and allowed to soak overnight. Cassia can also be propagated by softwood cuttings taken during summer. Some hybridization has been undertaken. There is a pale whitish yellow variety named Cassia bicapsularis 'Buttercream' and another vivid dark yellow Cassia bicapsularis 'California Gold'. Both of these hybrid flowering shrubs and their species are readily available in local nurseries or online garden plant suppliers. In addition, there are many other varieties of cassia which can vary widely in growth habit and flower form. 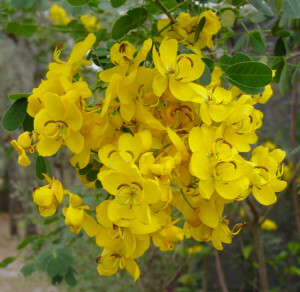 Most all of them, however, have the distinct yellow blossoms of Cassia bicapsularis.